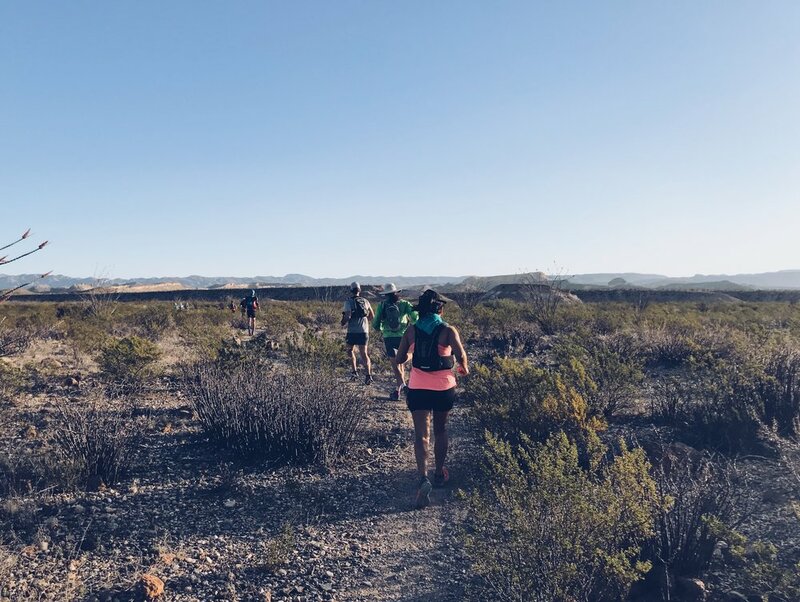 This past weekend, twenty adventurous trail runners headed West to Big Bend for Trail Roots’ first Runcation of 2019. 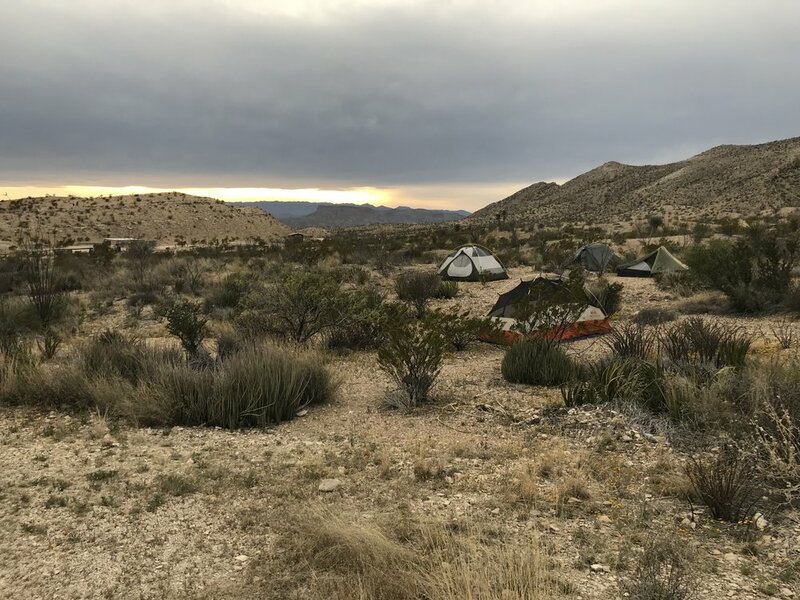 This annual trip has been coveted by Trail Roots members and friends for years, but for many of us, it was our first experience of this sprawling and majestic landscape that defines the border of Mexico and the United States. To our good fortune, it also happened to be the largest bloom of the gigantic bluebonnets, common to that area, in over 30 years. For Texans, the arrival of bluebonnets signify that spring is on the horizon, and with it brings longer days and warmer temps. We all left Austin piled into cars stuffed to the brim with camping gear and snacks, and made the long trip to Terilingua, an old mining town just outside the parks where we’d set up camp for four peaceful, cellphone free days. After unloading and pitching our tents, we chowed down on Brin’s homemade chili baked potatoes, then fell asleep in our tents beneath the famous Texas starry night sky, anxiously awaiting our first run in the morning. At 6am, Erik led a morning meditation followed by breakfast and coffee. Once we gathered our gear, we drove to Big Bend National Park to run two trails. The first one was the five-mile Window Trail that meanders down into a canyon, surrounded by massive rock formations and ending at the famous “window”. We carefully hopped on stones across a stream with birds and butterflies flapping past. Early morning is always the best time to run, with fewer people on the trail, nature captivates all of your senses. It’s an incredible feeling to be running in a wild National Park and seeing all of your friends run by with huge grins on their faces, occasionally stopping for a photo op. The end of the trail, and I do mean the end, there is the “window” which is the top side of an ancient waterfall in the crevasse that overlooks a truly stunning view of the Chihuahuan Desert. Many of the runners took careful selfies with the “window” and the spectacular desert in the background. After returning back up the Window Trail, we headed up to Emory Peak for a 10-mile hike to reach the 7,832 ft peak. Combined with a rock-climbing scramble to the top, we were granted unrivaled views of the Chisos Mountains. A few of us even saw a mama bear and her cub playing on the side of the mountain in a glen while running on the trail. Thankfully, no mountain lions were spotted. This day was our most demanding, but the National Park is an stunning place to spend the day and being able to run through the trails was a dream come true for any outdoor enthusiast. After our run, we gathered at a natural hot spring along the banks of the Rio Grande River for nature’s own hot/cold treatment to soothe away any fatigue from the day. Piled into the small hot pool, we sat shoulder to shoulder and swapped stories of our day’s adventure while drinking beer and eating chips. No one said this was a healthy retreat. That night, we all got seconds and thirds of grandma’s homemade spaghetti. Runners are not shy about their precious post run meals. Showered, fed and rested, we enjoyed a spectacular Big Bend sunset which quickly drifted into a dark glittering night sky. We sat around the campfire reflecting on a day well spent and took a moment to express gratitude for the opportunity to run in such a beautiful place and for each other. These trips help us realize that we are so much stronger as a group then we are on our own. We learn to rely on each other, to open up and to share the what’s on our hearts. Vulnerability is inevitable when you spend hours on the trails together. Day two took us to Big Bend State Park where we welcomed the flatter terrain, but had to endure the hot afternoon sun. We had the option of running a 10, 18 or 25 mile route, all with glorious views and never-ending blue skies. We were lucky to run through rows of bluebonnets and other colorful desert flowers on the out leg of the run. A couple of us added a few more miles due to some creative navigation, but we got back on the main track, having enjoyed spending extra time together. Running in like-paced groups, we never run alone, which assures that no one gets lost or hurt. Besides our high-tech emergency communicators, Erik, our experienced leader, always makes sure every person is well looked after, is felling ok and has a good time. We are always grateful for his ability to run back and forth between the groups of runners, checking in on everyone’s wellbeing. He always waits for the last person to finish, which is comforting and heartwarming. Once we got back to camp we dressed up in our best evening trail clothes and headed to the Starlight Theater for food, Country music and dancing. Downing cheeseburgers, queso and other Starlight delights, no calorie is shameful after running for hours in the desert. We headed back to camp and danced and sung to old 90s rap songs and the occasional emo ballad, while making smores and laughing hysterically. We wanted to hold on to our last night of freedom before heading back to our busy lives in Austin. The trip seemed to fly by, as most vacations do, but we were all grateful that we experienced this remote area of Texas by running along it’s ancient and mythical trails. The Big Bend trip was an overwhelming success; stories and inside jokes are sure to be relived on future runs for years to come. 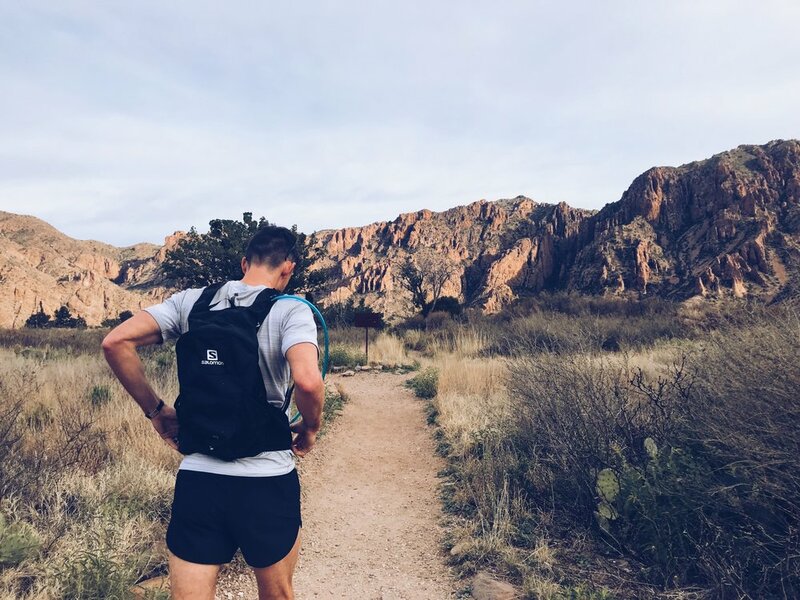 Being able to step out of the daily hustle, even for only a weekend, into a wonderland of trails and mountain views helped us recharge and revitalize our passion for running. The best part is going with such a diverse and fun group of trail running friends. 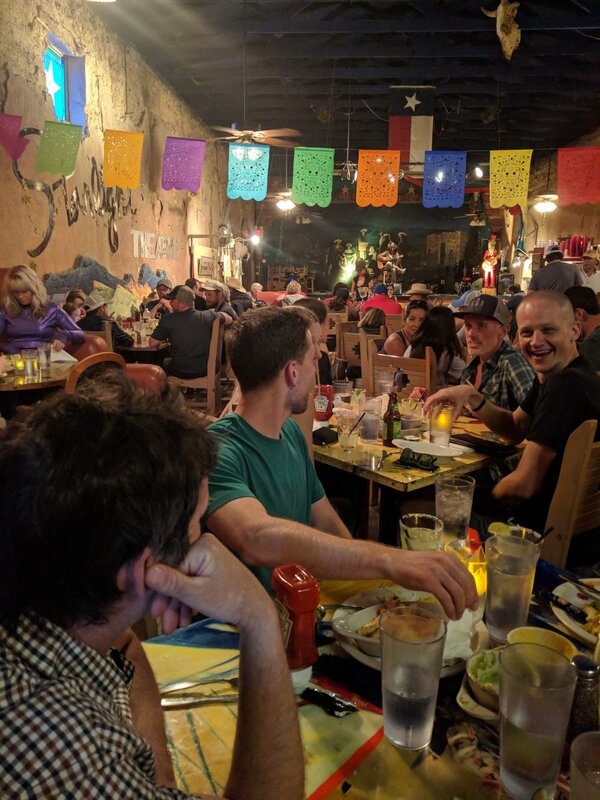 We are an Austin, TX running group! We have trail races, running vacations, guided trail runs, road runs, track runs, group and individual coaching and training, a welcoming running community, and more.